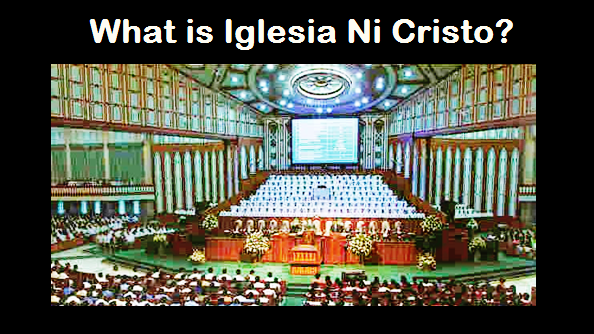 WHY DO YOU SAY THAT THE LORD JESUS CHRIST IS THE FOUNDER OF THE IGLESIA NI CRISTO (CHURCH OF CHRIST)? The first that persecuted Christ’s disciples were the Jews. During the Jewish persecution, Apostle James (the Great) and Stephen (the deacon) were put to death. Then, the imperial persecution of the Church came. It was Emperor Nero who was the first Roman emperor to persecute the Church. Then, after two decades, another emperor persecuted the Church, Emperor Domitian. At the end of the first century, many disciples were killed because of the imperial persecution of the Church. "Now the Spirit speaketh expressly, that in the latter times some shall depart from the faith, giving heed to seducing spirits, and doctrines of devils. "Although celibacy is not expressly enforced by our Savior, it is, however, commended so strongly by Himself and His apostles, both by word and example, that the Church felt it her duty to lay it down as a law. "What does the second commandment of the Church order us to do? When the Church of Christ of the first century departed from the true faith and followed the erroneous teachings (teachings not taught by the Lord Jesus and His apostles, and not written in the Bible) like clerical celibacy and abstaining from meat, she became the Catholic Church. This is the reason why it's the Catholic Church that continued up to this day. Thus, the Lord Jesus Himself warned His disciples that apostasy will take place. Because the first century Church of Christ will be apostatized, the Lord Jesus Christ promised, “And other sheep I have which are not of this fold; them also I must bring, and they will hear My voice; and there will be one flock and one shepherd.” Christ promised to re-establish the Church Of Christ or that the true Church will re-emerge for He has "other sheep." According to Apostle Peter, the promise is: (1) “unto you”; (2) to your children”; and (3) “to all that are afar off.” These are the three groups of people that compose the Church the Lord Jesus Christ established. "Therefore let all the house of Israel know assuredly, that God hath made the same Jesus, whom ye have crucified, both Lord and Christ. Although Apostle Peter mentioned “to your children,” he is not referring to the literal “children” of the Jews, because in verses 36 and 38 of Acts chapter 2 he said, “Therefore let all the house of Israel know assuredly…For the promise is unto you…” Apostle Peter was referring to the Gentile members of the Church who were “children” of the Jews “through the gospel.” Apostle Paul said that “I have begotten you (referring to the Gentile members of the Church) through the gospel. Because apostasy will take place at the first century Church of Christ, the Lord Jesus promised that He has “other sheep” not of the fold already established in the first century (the first century Church of Christ). He will bring them also and form them as one flock (Church of Christ). Thus, when the Lord Jesus Christ said that “…other sheep I have which are not of this fold; them also I must bring, and they will hear My voice; and there will be one flock and one shepherd” He is referring to His re-establishment of the Church of Christ. Thus, Christ’s “other sheep” was prophesied by the Bible to emerge in the Far East. The fulfillment of the biblical prophecy was the emergence of the Iglesia Ni Cristo (Church Of Christ) in the Philippines. The Iglesia Ni Cristo was registered in the Philippine government on July 27, 1914. This was the official date of the establishment of the Church Of Christ in the Philippines. Thus, the emergence of the Iglesia Ni Cristo in the Philippines in July 27, 1914 was the fulfillment of the biblical prophecies regarding the emergence of Christ’s “other sheep,” the re-emergence of the Church Of Christ. OF CHRIST IN THE PHILIPPINES IN 1914? Thus, the people will hear the voice of the Lord Jesus Christ through His messenger. Remember what Christ said in John 10:16 that, “them also I must bring, and they will hear My voice, and there will be one flock…” The “flock” referring to is the “Church of Christ” (cf. Acts 20:28 Lamsa). Therefore, through the instrumentality of God’s messenger in the last days, Christ was able to build His Church (the Church Of Christ) in 1914. We believe that Brother Felix Y. Manalo is the Messenger of God whom He sent to preach the pristine Gospel of Christ in the Philippines. He was the one used by the Lord Jesus Christ so His voice will be heard by His “other sheep” and so He could bring them also and form into one flock (the Church Of Christ). Hence, Brother Felix Y. Manalo was not the founder of the Iglesia Ni Cristo or the Church Of Christ, but the messenger of God sent to preach the pristine Gospel of Christ, and the one used by the Lord Jesus Christ in re-establishing the Church Of Christ. 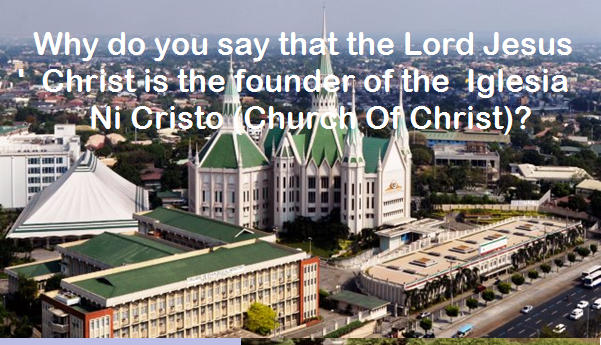 THUS, THE LORD JESUS CHRIST IS INDEED THE TRUE FOUNDER OF THE IGLESIA NI CRISTO (CHURCH OF CHRIST) IN THE PHILIPPINES, AND THE EMERGENCE OF THE IGLESIA NI CRISTO IN THE PHILIPPINES IN 1914 WAS THE FULFILLMENT OF CHRIST’S PROMISE OF RE-ESTABLISHING HIS CHURCH BECAUSE APOSTASY TOOK PLACE IN THE FIRST CENTURY CHURCH OF CHRIST. I am Proud to be a member of the Iglesia Ni Cristo (Church Of Christ) for this Church is the one establish by the Lord Jesus Christ.